Comments on the first three lines of the poem Atchafalaya Is have appeared earlier in Riverlogue postings – now for the fourth line (bolded above). Commercial fisherman – what does that mean? A lot of different things to people of varied perspectives – a lot of different things. To a consumer of the fish he catches, a commercial fis herman is rarely thought of at all. There is a disconnect between the harvest and the dinner table, a lack of awareness similar to a consumer not knowing how his hamburger comes to be on the plate in front of him. Or a child really knowing the relationship between that big bag on a cow and the big plastic container in the refrigerator. To an environmental activist a commercial fisherman is viewed with suspicion, guilty of unknown but probably ungreen practices. The assumption remains even though no supportive facts are offered. But, to his children, the commercial fisherman is a person endowed with almost magical powers. He can foretell the weather sometimes, and he can read a story in the water when wet is all it is to most people. And he does things that children can understand, and those things bring food to the house, either directly or by converting his fish into money. Whether he is fishing fish, or frogging, or crawfishing or whatever, his children can see what it means to be good at something. And because they can understand the relationship between the man, and the skills, and the rewards, they often want to be like him – both the boys and their sisters too. And not long ago it was possible to become like him, but not very much any more. It’s not for lack of desire that these kids can’t be like their fathers, it’s because there is no longer a complete system to support them. There must be an unbroken line to connect the harvest, the transportation and the sale for any commercial undertaking to succeed. A computer programmer harvests with his mind, a process transports his product and his employer is the buyer. A commercial fisherman harvests with his skills also, and to some extent controls the transportation, but there is nothing he can do if there is no sale for his product – fish in this case. There is no employer to arrange a sale for the commercial fisherman. So, the unbroken line is no longer true for most commercial fisherman in the Atchafalaya Basin. The line in the poem says “make” a living, not “made”. And it is true that some commercial fishermen do still make a living in the Basin. Net fishermen with a lot of resources and a place to sell can do well, my friend Rusty from Simmesport does. Crawfishermen do well when the water is high enough long enough. Frogging can still be profitable if the man is willing to sell his frogs cheaply enough, and if there are enough frogs. But these days, neither of these activities will support a family by itself, making some supplemental means of earning a living necessary. Often fishing is done on his days off by an offshore oilfield worker whose father was a commercial fisherman. Such a man was the one pictured in the boat with me. He caught the big goujon and let me hold it for the picture. I ask my friends why they became fishermen and stayed doing it for most of their lives. Most tell me that they were born into it; they watched a father do it and learned from him, or an uncle maybe. Very few people I have talked to became commercial fisherman in some other way. When asked what is so important about that particular way of earning a living, they say “catching fish”. Not so small a thing, that. When someone does something for 50 years, and still looks forward to the next day doing the same thing, a “hmmm” is justified I think. I watched my friend Edward fishing trotlines a few years ago, and I was amazed that he would still get excited at the feel of a fish on the line, even if it wasn’t a very big fish. He would get that focused-attention look on his face and then when the fish was safely in the boat you could see satisfaction. He had been doing this, for the most part, for 60 years. And he still had fun. Man! Find me a job like that and I would work at it until I …. whatever. Better yet, find me that job 40 years ago. So, the fourth line of the poem has significance because the Basin once was and to some extent still is a place where that most important of life’s requirements was supported – earning a living. This has to be a part of any comprehensive definition of the Atchafalaya Basin. The river is at 11.1 feet on the Butte La Rose gauge today, rising slightly to 11.5 feet day after tomorrow. But, and it’s a big but, the Ohio is falling hard and so it looks like falling water for the Atchafalaya by next week. Would have liked to have the water stay into May sometime, but it doesn’t look like it will unless they really get some prolonged rain in the Ohio Valley. Sunrise on the river on a chilly morning. When the sun looks like this it makes you feel like the scene is incomplete somehow. The light is there, the shadows are created, but where is the warmth? Sometimes an unfulfilled promise is like this, all the words are there but there is no sincerity, no truth, no warmth and it becomes a one-sided communication. I wish I had always known this when sharing myself with children in the past. It is hard to think of becoming light without warmth to a child. Even little promises matter. Life at Butte La Rose goes on, always interesting, always changing, always ready to teach something. A couple days ago I was processing some reclaimed cypress lumber in the yard. I pull the nails out of it, brush the dirt off if necessary, and trim the ends so that the wood will be ready to use when the time comes to give it life again. I walked around a small area that day for several hours, back and forth, back and forth. At some point I noticed something in the leaf litter and looked harder at it. 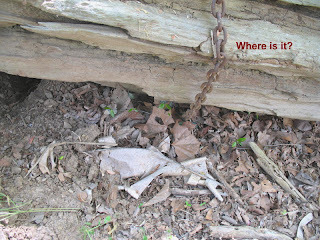 Yep, it was a snake, coiled up near a log and resting comfortably (it seemed) very near my foot. It was a small copperhead, venomous, but not dangerously so. It had been there for some time, judging by its position and demeanor. It’s not obvious down there where I first saw it, but look for something circular – not many things are circular, like the coils of a snake, in nature. The close-up of the pattern of the colors is striking, I think, when not blended with leaf litter and forest debris. A larger copperhead, about two feet long, had Carolyn treed in her car in the garage last week but I rescued her like the knight in shining armor that I am. Anhingas are called snakebirds sometimes. They have those long necks and slender heads and beaks and often that is all you see when they swim on the surface. Of all the water birds around here, they are among the most adept at getting food from an aquatic environment. They swim and take fish on the fishe's turf and make a living at it. Then they hop up on a branch near the water and spread their wings to dry them, a thing seen often by people who watch the water. But they aren’t limited to that. It can come as a surprise to see anhingas soaring high, very high, in the warm currents of updrafts. This picture is of four of them doing that last week. So, from down in the dim depths of the river in the morning, to cruising at two thousand feet in the afternoon - the master of both elements. Something to admire, being able to fish and soar on the same day. The river is at 11.3 feet at the Butte La Rose gauge, falling slowly for the next few days to about 10.6 feet by Friday. The Ohio and Mississippi are both rising above Memphis, with the Ohio kicking in with strong to moderate rises up into its watershed. More water will come to keep the river up. We haven’t had too many of those nice, slow, lazy, rainy afternoons lately. Last week we did have one of them, and the things that need a drink from time to time seemed to smile in the wetness all afternoon. It was one of those times when you can smell the wet in the air, and mixed with the leaves and the dust and the shingles on the roof. Once I would have liked to have gone out and walked in the soft rain and felt it, now I am content to watch it from the screen porch – a sign of age? Or maybe something else not easily admitted. One of the great things about that afternoon was the sunset it produced. There are always clouds after that kind of rain, and mixed with a lowering sun, some never-to-be repeated patterns form in the sky and then close into darkness like the end of a really good book. Such a time was that afternoon. But before the light faded there was another something to see, a rainbow across the river. One more time I was reminded of why I always keep a Canon in my pocket when I walk outside. Because not only was there a rainbow, but there were two of them, and not only in the sky but one of them was reflected on the mirror surface of the river. Oddly enough, the one in the water made the better image. I turned back towards the house, thinking of the various ways light can be impressive – in sunsets and in water vapor prisms in the sky, and bouncing off of calm water. A few fish crows flew overhead, slowly moving in the direction of the river behind me, and their nasal cries were loud and drew attention. More of them came and joined the first ones in that open-ended carefree dance that crows do in flocks. 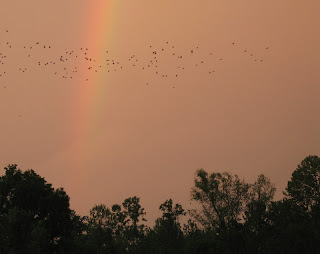 Turning back toward the river I could see more and more of the crows coming together in one long, strung out group and I realized they were heading toward the rainbow – you could still see it across the river. All this time there is this loud and continuous calling. I counted 139, and on they went toward the rainbow, and then they got to it, and they stopped forward motion and began to circle the rainbow. I almost forgot to try for a picture, but not quite. On they went, round and round the rainbow, calling and many of them doing things in flight that comes so close to what we would call playing that I would not know what else to call it. Sometimes they would tumble in pairs, flipping over with exaggerated wingbeats to recover what might have been a sense of dignity. Sometimes four or five would do this in a kind of ball of crows. Surely, I thought, this is coincidence, their being there mixed in with the rainbow for so long a time. They would leave the rainbow for a little while and sit in trees, and then fly back to it and through it to the other side and sit in trees there. Surely it was coincidence. Surely. My friend was found below Morgan City in the Atchafalaya River main channel, about 25 miles downstream from where he drowned three weeks ago. A tugboat found him. There were no reported signs of violence. It is better that he was found, if for no other reason than the closure it provides for his family and friends. Some might say the cycle of his life on Earth is now complete. The river is at 11.3 feet on the Butte La Rose gauge, and it will stay about there for the next several days. For the time being that is enough water for crawfishermen to make a living in the Basin. The Mississippi and Ohio are both falling up above so they will not support this level of water for long. The recent rains we had came to us in the late afternoon and lingered for a while as a slight drizzle, tapering to a full stop a few minutes before sundown. The rain left the sky full of low clouds, and the river with wispy banks of mist rising and twisting from the water. We have a grandchild living in Houston named Ava Rose. At the time on the title of this posting, Ava was a little over a year old, and visiting with us here at Butte La Rose. One of the things we like to do with very young grandchildren is to take them out in the yard to experience being outside in a natural setting. We talk to them about the environment around us. We know the things we say won’t be remembered in the conventional sense, but we hope that the experience will carry forward anyway. Maybe when the time comes to react to something in nature, they will perceive a friendliness and be open to the opportunity rather than automatically rejecting natural things. Not much to offer in the face of the electronics industry and all its lure, but it’s all we have. So, on Easter morning 2005, we set off with Ava in my arms and Carolyn talking to her and using the video camera. We began on the dock. I raised a shrimp trap and opened it and held up a bunch of river shrimp for Ava to see. She immediately reached for them and soon was picking them up off of the floor of the dock and putting them back into the water. It was an encouraging thing to see, a child doing that with no apparent fear. We played with the shrimp for a while longer and then closed the trap and reset it in the water. Napoleon watched all of this from a short distance. Next we moved back along the boardwalk to the bank and the first of the birdhouses we intended to investigate (all 11 that I have in the yard are mounted about five feet off of the ground so are easy to open and look into). I knew that the birdhouses often contain treefrogs. Sure enough, there were two gray treefrogs in the first birdhouse we opened. Ava reached toward them, so I caught one and handed it to her. She clenched it in her fist, and then seemed to get this faraway look in her eyes, as though she was listening to some voice only she could hear. I noticed that the frog was coming under more and more pressure in her fist, so I asked her to give it back to me. She just remained motionless and stared into open space. I raised my voice a little and asked for the frog again, with no response. Finally I got her attention and pointed to the frog and held out my hand, and she gave it to me. I put it unhurt back in the birdhouse. I would really like to know where her mind was for that little while . It certainly wasn’t with us. Continuing the tour we moved to the next birdhouse. This one was mounted on a chainlink fence. Each of these birdhouses is constructed so that you can open it from the side or the top, or both. We opened the side and looked in and the box was filled with moss. Sure enough, we looked in the top and there were four brown and white speckled eggs in it. These belonged to a chickadee that I had watched build the nest. We looked and then closed the box, and moved on without comment. We saw a prothonotary warbler fly out of the next box before we got to it, and sure enough there was the beginning of a nest in it. We moved on. The next box was one I knew had been occupied earlier by a pair of bluebirds. Their nest had failed for some reason and I didn’t expect to find anything of interest here. But when we got close to the box we could see a female bluebird looking at us from the inside, just staring out at us through the entrance hole. She really didn’t want to leave the nest but I was curious to see what progress had been made on this the second try for this pair. Eventually we got too close for comfort and the bird left the box and flew up to some nearby low branches and sat there watching us. The male joined her from somewhere. I opened the top of the box and there were five of the prettiest blue eggs you ever saw. It has always seemed fitting that bright blue birds have bright blue eggs, and makes you wonder why cardinals don’t have bright red eggs, or canaries bright yellow ones. Oh well. Anyway, there were these beautiful eggs, about the size of those small gumdrops. Knowing that the parents wouldn’t mind us doing it, I reached inside and took out one of the eggs for Ava to hold and look at. Carolyn is videoing this whole thing, as I said. I put the egg in Ava’s hand and she looked at it closely, and just then I remembered the squeezed frog. But, no, she didn’t crush it, instead with lightning speed she popped the egg into her mouth. Remember this is Easter Sunday, with all the edible colored eggs so much a part of the season! Suddenly there was this flurry of oohs and aahs and quick motions toward Ava’s mouth. I held out my hand near her chin and out popped the egg, wet but in otherwise good condition. I know it must have startled her to see those big people lunge toward her, but to her credit she didn’t cry or seem to notice it much. It was quite a moment, and to get all this on video was one of those rare incidents that you never get documented, but we did. Trying to tell it in words doesn’t begin to do it justice. The rest of the walk was bland compared to what we just saw. The adult bluebirds went back to the nest when we were only a hundred feet away, and they raised a full family of young from that clutch of eggs. I have wondered if one of the young birds had a vague feeling of once being thrust briefly into a dark, wet cave and then just as quickly being outside again. And I wonder also, if this eventually finds its way to “America’s Funniest…”, do you have to split the money with the birds? The river is at 10.7 feet on the Butte La Rose gauge, rising a little to 11.0 by Monday. The Ohio and Mississippi are both falling and will not support the water we have now. A recent letter from Governor Blanco to General Creer of the Corps of Engineers requesting an increase in the flow from the Mississippi to the Atchafalaya has been denied, so I’m told. I don’t believe the amount requested would have made much of a difference anyway. Comments on the first two lines of the poem Atchafalaya Is have appeared earlier in Riverlogue – now for the third line in the poem. 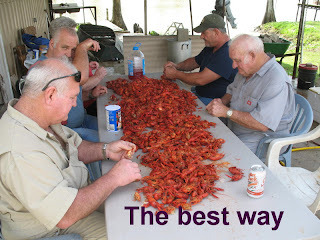 And it has meaning because the Basin is where the whole idea of edible crawfish began, at least in Louisiana. Oh sure, people all over, especially kids, have caught crawfish of varied species in ditches and wondered if they were good to eat. Some even tried to cook and eat them, with mixed and sometimes humorous results. Considering the phrase “most of our crawfish” really has to do with two aspects of their popularity: domestic use and commercial sales. Talking to the old people from the Basin, you are told that in the very early days no one thought much about catching enough crawfish to sell, there wasn’t much of a market or an easy way to get them to it if there was one. They caught what they wanted to eat, in stews for the most part, but not large amounts and not to boil. Why didn’t they catch them for sale? Wire for traps might have been scarce, but early galvanizing was better than we have today, so what there was should have held up well. The boats? Well, it pretty much would have been pirogues, pre-motorized skiffs having the necessary pointed bows would not have had a means of getting through the woods - what with the long oars they had. So pirogues it would have been, and while there were plenty of them you can only do so much paddling a pirogue in a day’s time. Despite this, we do find that there was a limited commercial harvest in the Basin as early as 1880. In that year a harvest of 23,400 pounds was recorded. 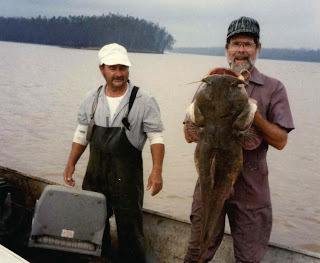 Twenty eight years later the harvest was up to 88,000 pounds, all from the Atchafalaya Basin. As we know, the commercial harvest has continued to increase, with some ups and downs, to the present time. 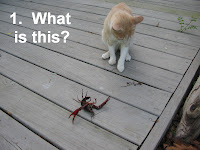 Until the middle of the last century, most of the crawfish sold commercially were wild crawfish, i.e. they came from natural areas like the Basin. But by the mid-1950s the practice of reflooding rice fields to produce a crop of crawfish was becoming widespread and today a very large portion of the crawfish available comes from these farming practices. The ability to produce them for a commercial market in the fall months, as opposed to the wild product only available in the spring, has widened the popularity of crawfish in general and farm-raised ones in particular. And due to the somewhat increased control of the growing conditions, farms tend to produce a more reliable supply. 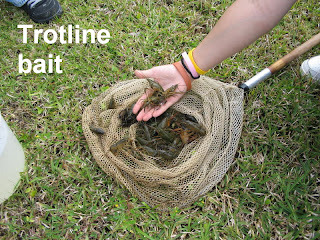 A review of the history of crawfish farming may be seen in an LSU AgCenter bulletin, entitled “A Brief History of Crawfish Farming in Louisiana”. The introduction of packaged, frozen crawfish meat from sources outside the U.S. has also reduced the significance of the domestic wild-caught crawfish market. As more and more of this is imported, Basin crawfish maintain a smaller and smaller proportion of the total commercial volume. Adding this to the volume produced by farming is the reason for the third line in the poem. 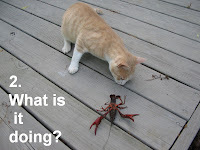 I have a warm feeling for the activities associated with catching wild crawfish. It is an attractive way for someone with limited means to acquire a pretty large amount of cash very quickly. 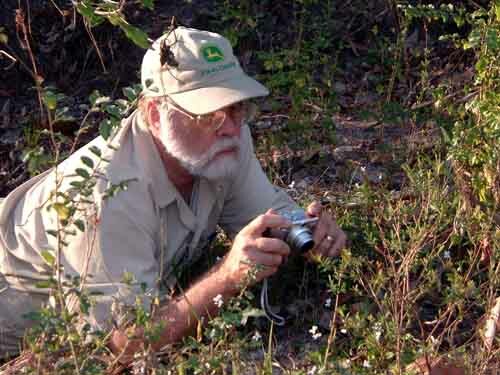 This is provided, of course, that they have at least the minimum skills necessary to build traps (buying them is too expensive), operate a boat in the most unbelievable circumstances, avoid wasps while staying inside a boat, estimate the distance between two trees compared to the known width of the boat, be able to get through the swamp following mysteriously disappearing little flags that are placed to mark the trail, and on and on. Yes, it is easy if you know how. Added to this is perhaps the most elusive skill, knowing the unwritten code of conduct of crawfishermen who have done this all their lives. This complex code involves knowing how far away to stay from an established run of traps belonging to someone else, and what it means if one of your traps is found hanging in a tree instead of being in the water where you put it. One time is a warning (more or less a polite one), the second time is a confrontation, the result of which may depend more on the temper of the other man than your apology for ignorance. There is a special thing about being in a boat in a flooded swamp in the springtime. It can be a unique experience. Part of this is due to the sheer otherness of being able to glide, floating among trees that your mind says you should be walking among. It’s like someone opened a magic door and is letting you do a thing you normally could not do. And then there is the color of the new leaves, and the smell of flooded forests and the chill in the pre-dawn air. The birdsong in a springtime flooded forest is beyond description, or at least beyond my ability to describe it. It is so loud and so continuous that after a little you cease to notice it, it becomes a background for the whole experience of the swamp – a memory that is kept but not remembered for itself. Some of the most special things are like that, I think. One story before I stop this. It involves a practice I used to do when run ning a line of traps in the Basin. Many of my friends would start their run at daylight and push hard all day until the last trap was run and the last sack of crawfish was stacked in the boat for the ride home. But not me, I always had to take something for lunch and stop wherever I was at mid-day and just sit still quietly floating among the trees in the shade for a little while. The most amazing things happened during the times I did that, from barred owls fighting in a tree directly above my boat and falling down into the water right next to me and then squawking and flapping up onto my boat to dry off before finally noticing that I was there and looking at me with that “WHAT?? ?” look; to mink and beaver seeming to completely ignore the fact that a boat and a man were ten feet from them as they went about their business. But one of the most memorable things had to do with crawfish and snakes. When the oxygen in the deeper water is low, as happens often, crawfish will come up off of the bottom and place themselves near the surface where there is more oxygen. They will just sit there clinging to trees, bushes or whatever is available with the underside of their pink gill membranes at the surface where they will stay wet, almost breaking the surface. If you are in a sort of open area, where the trees are spread out a little and there is some open water in lanes that you can see, in the right light conditions these thousands of crawfish with their gills at the surface appear like a pink haze covering the surface. If you get down low to the water and look, you can see that. So, I sit in my boat in a flooded forest quietly eating a sandwich and after a while the crawfish begin coming up to th e surface. Soon so many of them were up that every tree, twig, water lily (hyacinth) and whatever had crawfish attached sideways to it. Everywhere you looked there were crawfish. So far this was notable, but not that unusual if you are receptive, but what happened next was unusual. There are many water snakes in the Basin, and some of them eat a lot of crawfish – showing us an expected predator/prey relationship. This water snake comes toward me across the water, swimming lazily and seemingly without a particular destination, just kind of changing locations, sort of. It is about two feet long, and on it comes. There is a tree about three feet from my boat, and this tree is about ten inches in diameter at the water line and there are about eight crawfish ringing it like a living necklace. Aha, I think, the snake is hungry. Now, this is the time of year, in May, when the crawfish have matured to their maximum size and turned more red than green, and they have the big claws that are worth eating. On the snake comes, and it passes a few inches from the tree in question, but ignoring the crawfish. As it slowly passes the tree, a red claw comes out and attaches to the snake’s tail. And I think, well, this is different. 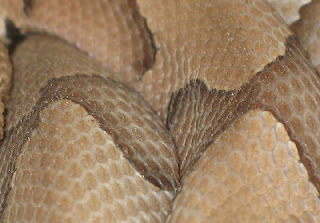 The snake comes to a slow stop and just sits there on the surface with that claw attached to its tail. 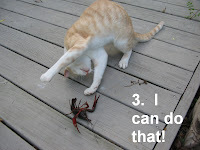 And then another claw comes out from the other side and below and attaches to the tail. And the snake begins to resist what is happening. It starts to do the snake-wriggling thing, becoming more and more vigorous as more and more claws come out of nowhere and attach. By now the tail end of the snake has disappeared below the water and just the head and a couple inches of neck are visible. And then it is gone, thrashing out of sight. What an awesome thing! The predator has become prey. Knowing how fast these hungry crawfish can consume a piece of fish used to bait a trap, I think the snake was converted to crawfish flesh in fifteen minutes or less. And I got to see it just because I was able to sit quietly in the right place at the right time. So many wonderful experiences in natural settings are like that, and it is one reason I get concerned about my grandkids. If they don’t get away from the electronic games and get outside, they can’t have these types of quality experiences. Then again, maybe their time is meant to be spent doing their things, not mine, and in their own way are just as meaningful. This particular experience, when enhanced by a few other similar ones, has earned the title “Killer Crawfish of the Atchafalaya Basin” in a TV documentary done some years ago by Turner Broadcasting. The river is at 9.8 feet on the Butte La Rose gauge, rising to 10.3 by Tuesday, and taking a stand there for a few days. The Ohio and Mississippi are both rising slowly all the way up. No big changes, but it should be enough to hold the water we have now. Good for the swamp fishermen.